How Do You Educate For Lighting? 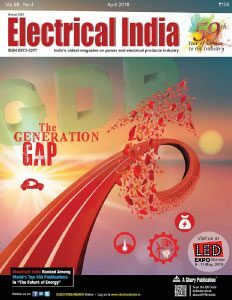 Developing infrastructure of roads, upcoming development projects, the booming construction industry in developing countries such as China, India, and Indonesia are expected to create massive demand for LED lighting for residential as well as outdoor application. The global LED lighting market accounted for US$ 26.09 billion in 2016 and is expected to reach USD 54.28 billion by 2022, growing at a CAGR of around 13 per cent between 2017 and 2022, reports Zion Market Research. LED is a semiconductor device that emits visible light when an electric current passes through it. The light is not mostly bright, but in most LEDs it is monochromatic, occurring at a single wavelength. The output from a LED can range from red (at a wavelength of around 700 nanometers) to blue-violet (near 400 nanometers). LEDs are comprised of compound semiconductor materials which are made up of elements from group III and group V of the periodic table. The LED lighting market is primarily driven by benefits offered by LED lights over incandescent and fluorescent lamps. In additions, the energy efficiency of LED lights, higher brightness, and a longer lifespan are some of the major reason offers tremendous market opportunities for LED lighting in coming years. 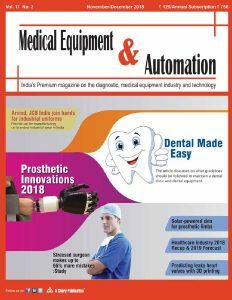 Continuous new product introduction by manufacturers such as Phillips and GE with innovative technology is attracting the customer attention globally. However, the high production cost is expected to have an adverse impact on the LED lighting market. Nonetheless, screen and display backlighting market development are likely to open new doors for the LED lighting demand. Based on application, LED lighting market is classified into residential, architectural and outdoor. Increasing use of LED lighting for outdoor application such as roadways, traffic lights, tunnels, parking lots, and garages is expected to provide significant growth opportunities in coming years. Residential application segment was the largest application for the market accounting for more than 40% share of total market 2016. The architectural application includes both functional and decorative lighting. Decorative LEDs are used to light up pools, gardens, fountains, and statues. The functional application includes landscaping and building facades. 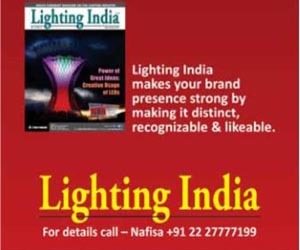 According to the report titled “LED lighting Market for Residential, Architectural and Outdoor Applications: Global Industry Perspective, Comprehensive Analysis, and Forecast, 2016 – 2022”, LED lighting market is dominated by some of the key participants such as Cooper Industries Plc, Osram Opto, Cree Incorporation, Zumtobel AG, Toshiba Corporation, Philips Electronics N.V., Digital Lumens, Inc. and GE lightings. 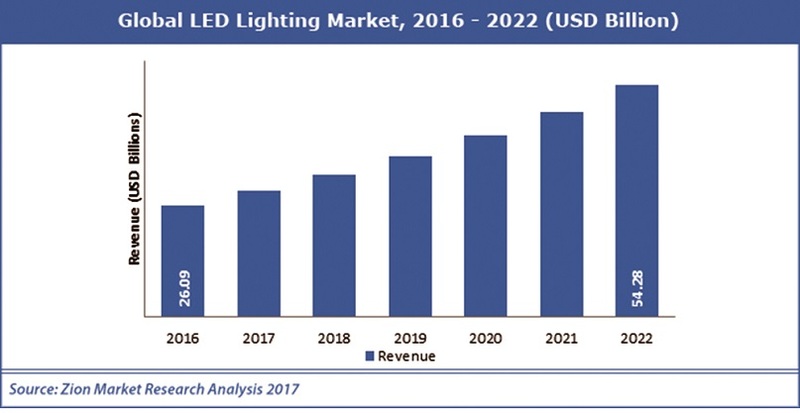 Europe held the largest share of the global LED lighting market and is set to continue to dominate the world marketplace within the forecast period, the report said. 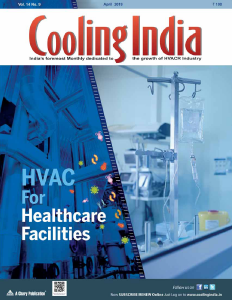 This growth is mainly attributed to the rising demand for outdoor application paired with stringent energy efficiency regulation. The significant demand for LED lighting for a residential purpose such as lighting for bathrooms, hallways, dining rooms, and kitchens is the major factor to surge the market growth in this region. Implementation of the EU Green Paper can lead to new opportunities for the European LED market in near futures. Europe accounted for over 31 per cent of the market share in 2016. North America is another leading regional market for LED lighting and is expected to witness noteworthy growth in the near future. Regulation over energy efficient product and high disposal income will help to drive demand for LED lighting for architectural application. U.S. is expected to be one of the lucrative markets for LED lighting manufactures. Asia Pacific is considered to be the fastest growing market for LED lighting and expected to hold significant market share in years to come. Developing infrastructure of roads, upcoming development projects, the booming construction industry in developing countries such as China, India, and Indonesia are expected to create massive demand for LED lighting for residential as well as outdoor application. It will include roadways, traffic lights, tunnels, parking lots and garages, lighting in bathrooms, hallways, dining rooms, and kitchens. Latin America is comparatively new and is still open to new companies and brands. Brazil will take control of the leadership role in LED lighting implementation. It is aggressively picking up on the deployment of governmentinstalled LED-based streetlights. The Middle East and Africa are also forecasted to show significant growth in the coming years. U.A.E. and Saudi Arabia are predicted to hold a noticeable market share in the near future.